DESCRIPTION -- Set of 4 full colour postcards showing scenes from the famous Battle of Trafalgar. They are in an unused condition and were brought out in 2005 to commemorate the 200th anniversary of the battle in 1805 (click on the picture to see a close up of one of the postcards). DESCRIPTION -- Early example souvenir plate of Lord Horatio Nelson which is in a fantastic condition and is 8" (21.5cm) wide and shows in the centre a picture of the famous commander. HISTORY -- Vice Admiral Horatio Nelson, 1st Viscount Nelson, (29 September 1758 - 21 October 1805) was a British flag officer in the Royal Navy. He was noted for his inspirational leadership, superb grasp of strategy, and unconventional tactics, all of which resulted in a number of decisive naval victories, particularly during the Napoleonic Wars. He was wounded several times in combat, losing one arm in the unsuccessful attempt to conquer Santa Cruz de Tenerife and the sight in one eye in Corsica. He was shot and killed during his final victory at the Battle of Trafalgar in 1805. DESCRIPTION -- Souvenir tankard commemorating the 200 year anniversary of the famous Battle of Trafalgar. Beautifully decorated and in a great condition this piece is a good display piece and in a great condition. (click on the picture for a view of the other side of the tankard). HISTORY -- As we all know the Battle of Trafalgar (21 October 1805) was a naval engagement fought by the Royal Navy against the combined fleets of the French and Spanish Navies, during the War of the Third Coalition (August-December 1805) of the Napoleonic Wars (1803-1815). DESCRIPTION -- Produced as a commemorative piece in 2005. This item is celebrating the 200th anniversary of the famous Battle of Trafalgar and the war hero of the fleet Horatio Nelson and is a limited edition plate. It shows a picture of Lord Nelson and details of the anniversary on the back. It is in an excellent condition and the size is 11" (28cm) wide and is number 160 of 1000 (click on the picture to see the reverse side of the plate). HISTORY -- The Battle of Trafalgar was fought on the 21st of October 1805 off Cape Trafalgar on the Spanish coast, between the combined fleets of Spain and France and the Royal Navy. It was the last great sea action of the period and its significance to the outcome of the war in Europe is still debated by historians. DESCRIPTION -- Pair of framed pictures commemorating the famous Battle of Trafalgar and the size of the pictures is 9Â½" x 7Â½" (24cm x 19cm) and have gold coloured frames which are in an excellent condition (click on the picture to see a view of the other picture). HISTORY -- The Battle of Trafalgar (21 October 1805) was a naval engagement fought by the Royal Navy against the combined fleets of the French and Spanish Navies, during the War of the Third Coalition (August - December 1805) of the Napoleonic Wars (1803 - 1815). Twenty-seven British ships of the line led by Admiral Lord Nelson aboard HMS Victory defeated thirty-three French and Spanish ships of the line under the French Admiral Villeneuve in the Atlantic off the southwest coast of Spain, just west of Cape Trafalgar, in Caos de Meca. DESCRIPTION -- This is a postcard showing a typical unofficers uniform used in the Battle of Trafalgar and it is in a very good condition. 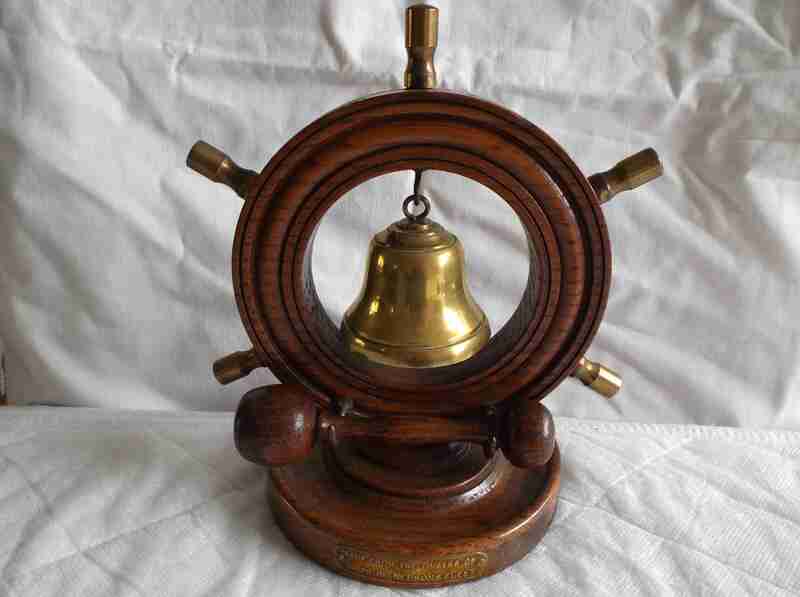 DESCRIPTION -- Early period item and stands 7" (19cm) high and is a wooden bell made from the timbers of the ships of Nelson's fleet and is in a good condition. The item includes a mounted wooden hammer. DESCRIPTION -- Colour postcard of Lord Horatio Nelson and is in a very good condition. HISTORY -- The Battle of Trafalgar (21 October 1805) was a naval engagement fought by the Royal Navy against the combined fleets of the French and Spanish Navies, during the War of the Third Coalition (August-December 1805) of the Napoleonic Wars (1803-1815). 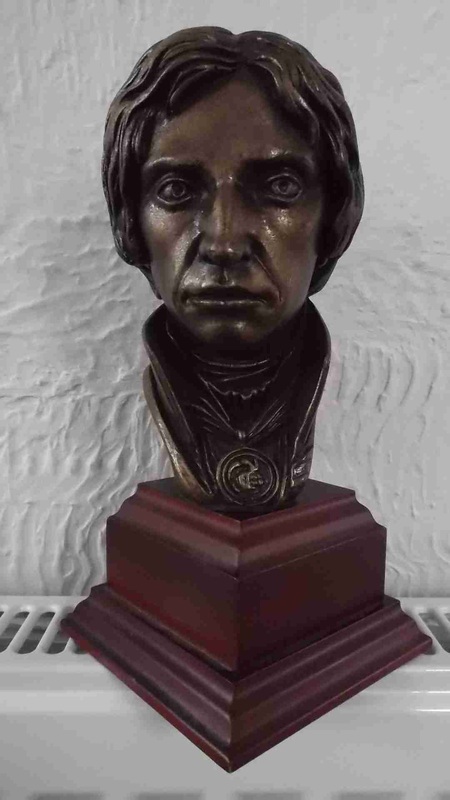 DESCRIPTION -- This item is a souvenir bust of Horatio Nelson and is in a great condition. HISTORY -- Born on 29 September 1758 in Burnham Thorpe, Norfolk, Horatio Nelson was the sixth of the 11 children of a clergyman. He joined the navy aged 12, on a ship commanded by a maternal uncle. He became a captain at 20, and saw service in the West Indies, Baltic and Canada. He married Frances Nisbet in 1787 in Nevis, and returned to England with his bride to spend the next five years on half-pay, frustrated at the lack of a command.